Is it just me or is it really the weather? I know “official” Philippine summer is already and still a few months out of sight but I am feeling something quite unusual these past few days and it is the very unforgiving heat. Quite strange because this is supposed to be the time of the year when visitors with odd names come to arrive at our local shores. On the other hand, this is something to thank for because at least we have been spared from dreaded typhoons and floods for the meantime. We have tried different ways to beat the hot temperature: stroll in the mall, soak in the pool, drown ourselves with ice cold water and everyone else’s favorite – indulge with delightful and drool-worthy ice creams and ice drops! I bought colorful teddy popsicle sticks which my niece really enjoyed. I wanted to keep the calorie at tolerable level so it is quite an extra challenge for me to make a cold dessert that is not only mouth-satisfying but also diet-friendly. As I was taking a short walk near our local market, I found abundant assorted fruits sold in the stalls. 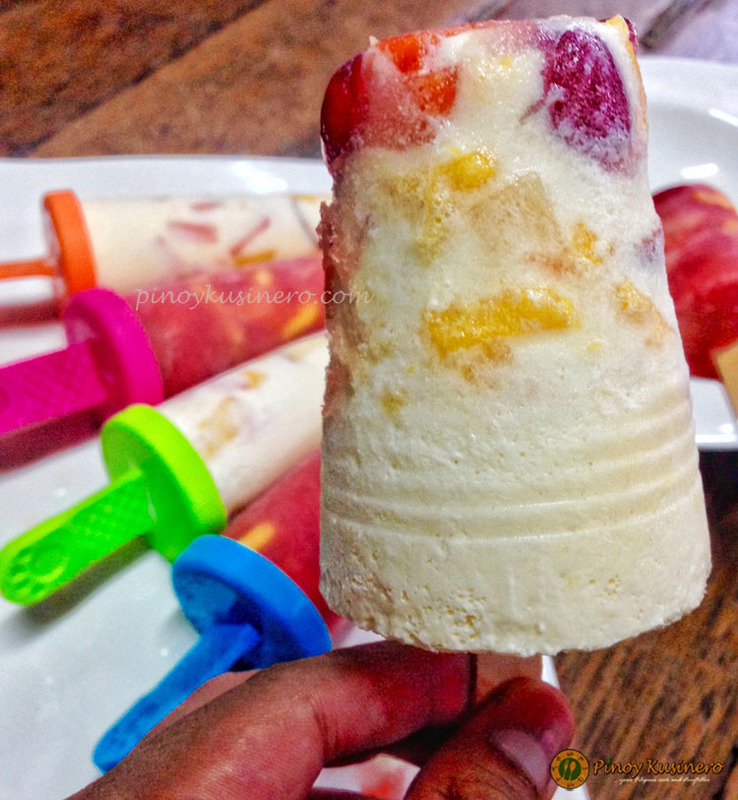 In an instant, I recollected about the ice creams and ice drops, hence, the fruit popsicles come into idea. There are plenty of ripened papaya as well as sweet red watermelons displayed in one array that I had passed by. Surprisingly, they are also being sold at lower prices so I grabbed several pieces while daydreaming about how my popsies would look like. I still have several fruits left sitting in the fridge for days. They are perfect for my dessert so might as well use them before they perish. I also bought some colorful teddy popsicle molds for my niece who is also a fruit and dessert lover like me. 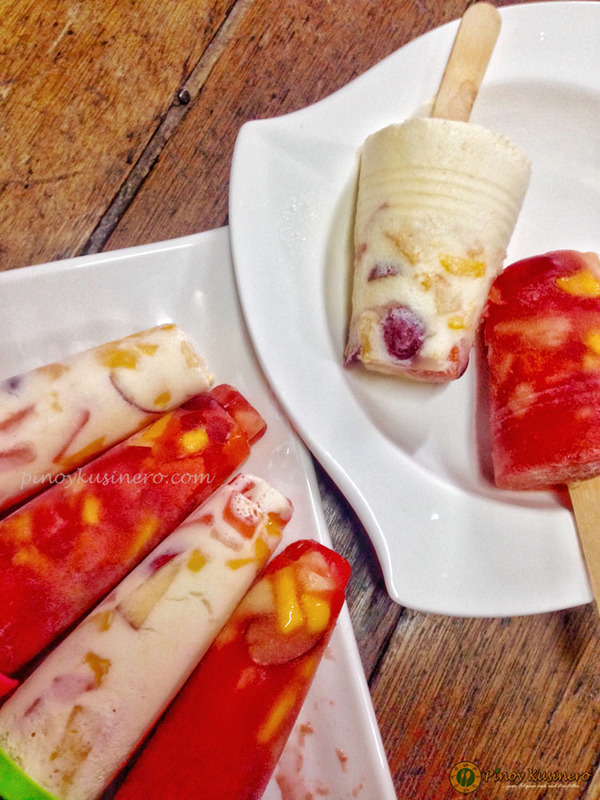 My two versions of fruits popsicles which became an instant hit! The combination of tiny fruit bits truly makes a wonderful burst of colors and flavors. 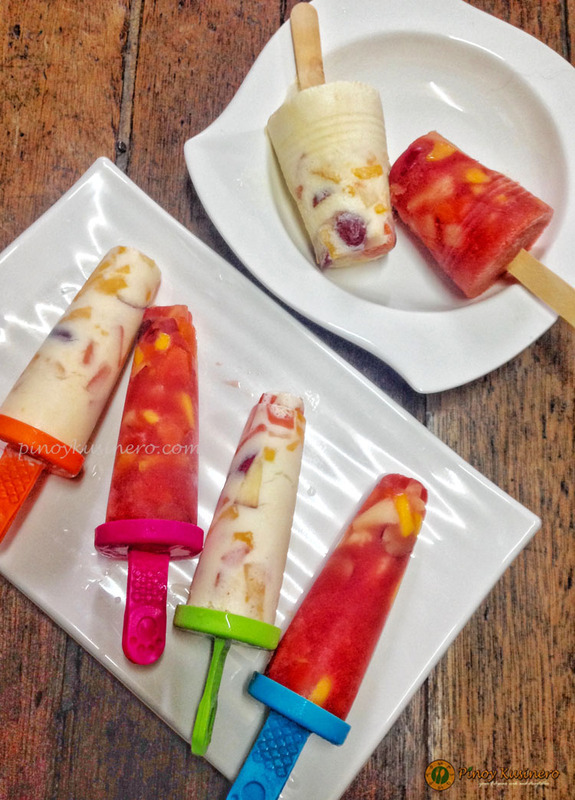 I made two versions of popsicle base – the watermelon puree and pina colada mix. I must say, both are equally fantastic. How I came up with the idea is a product of my niece’s vibrant imagination. She loves to draw and paint colorful pictures. She always has her coloring book with her with a new masterpiece one day at a time. Everyone was so pleased with the results of my Fruity Watermelon and Pina Colada Popsicles. Also, a very easy do-it-yourself dessert because most of the ingredients are available in the pantry. Well, if you are the type who always stock fruits inside the fridge, this one is really for you. Nonetheless, this is one healthy dessert that kids and kids-at-heart can definitely enjoy! To make the watermelon puree, combine the watermelon, water and muscovado or brown sugar in a blender or food processor. Cover and blend until the mixture becomes smooth. Set aside. To make the pina colada base, combine the pineapple juice and all-purpose cream in a blender or food processor. Cover and blend until frothy. Set aside. In a large bowl, combine the fruits except the orange. Add the juice of the orange and mix well. 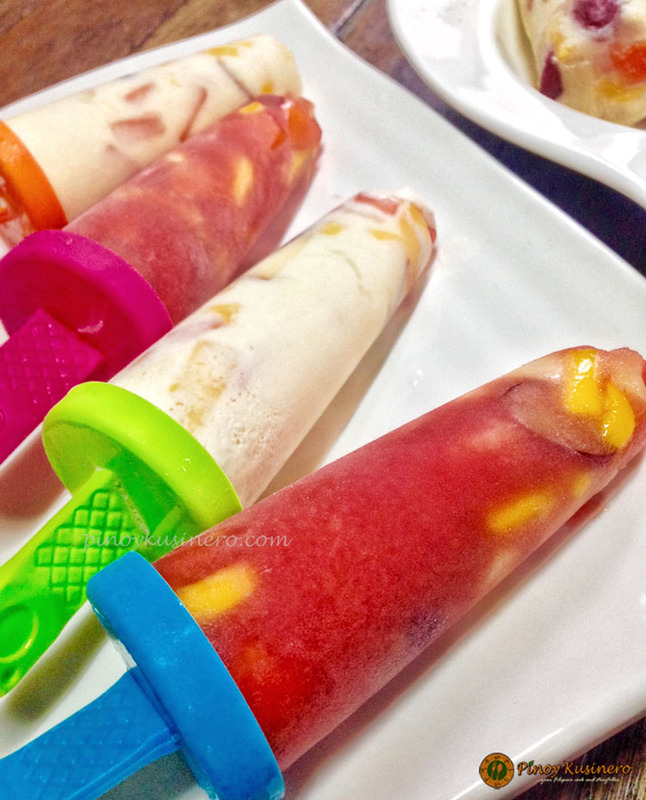 Add 1-2 tablespoons of fruit mixture in individual popsicle molds or mini plastic cups. Fill up the molds with your chosen base – pina colada mix or watermelon puree. Place a popsicle stick at the middle of each mold. Freeze the popsicles for 6 hours to overnight. Serve and enjoy! To release the frozen popsicles, soak the mold in tap water and gently wiggle the popsicle to loosen. Carefully stick out the popsicles from the mold. You can use any seasonal fruits available in your locality. Turn into adult popsicles by adding a dash of either vodka or light rhum. I enjoyed this post Enz! I am happy to learn I can do it at home. I like the vibrant colors and the popsicle sticks...so reminiscent of my childhood.